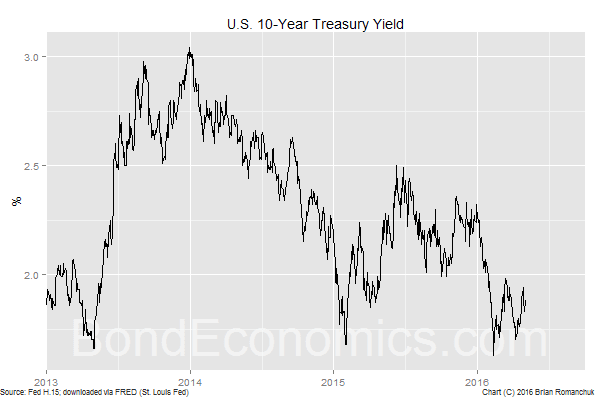 The bond market appears to be pricing a very sedate pace of rate hikes. If the Fed does follow the path of übergradualism -- raising rates at every second meeting by 25 basis points, or 100 basis points a year -- the 10-year Treasury is essentially pricing an end of rate hikes within two years (assuming a small term premium), presumably the result of some form of economic slowdown. This is not entirely implausible, given the lacklustre nature of growth. Since there is no sign of economic data being anything other than mediocre, it is highly possible that the Treasury market will remain mired in the trading range it has been stuck in for the past year.